How Do You Create Emotional Quality of Life in Homebound Seniors? Homebound seniors are miserably isolated. AARP has estimated the there are 19.6 million in the US This can be deadly to their quality of life. There is an answer called Virtual Senior Centers. These game-changing idea magically allows older people, who cannot get out, to use technology or the phone to enhance their emotional and physical quality of life. This is a brilliant idea. The Virtual Senior Center really opens up the world for homebound senior enhances their emotional and intellectual quality of life for seniors . It also elevates the quality of life of the caregiver because it gives them a respite and the comfort that their loved one is experiencing a program that offers joy- the joy that comes from joining a community, making new friends and learning new things you choose to be part of, an amazing benefit for homebound seniors. Self Help, a remarkable senior agency for Hollacast victims in New York City, put an extraordinary Virtual Senior Center together by partnering with Microsoft.. They have grown since their beginning to spread to many other cities.. Classes are led by a volunteer, like an opera class lead volunteers from a NYC opera company-. SelfHelp has loaned many VCS participants all-in-one, simplified touchscreen computers with a senior-friendly interface, as well as providing free access to VSC programming and technical support, and internet access. new participants can join from all over the country and check up the website for further information. If you are a geriatric care manager think of adding a personal assistant program that can enhance not just quality of care but the joy you give through quality of life care. 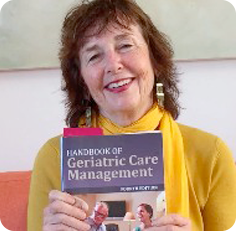 Paula Span who has written the New Old Age Blog in the New York Times for many years has great resources for older family members , geriatric care managers and aging professionals about seniors and falls. Here is a blog that has excellent falls prevention information .